When a wound swells up, turns red and hurts, it may be a sign of inflammation. Tissue repair and regeneration are crucial biological processes for the survival of all living organisms. When tissues are injured during infection or following toxic or mechanical injury, an inflammatory response is induced in response to damage-associated molecular patterns (DAMPs) and pathogen-associated molecular patterns (PAMPs) released by dead and dying cells and invading organisms. 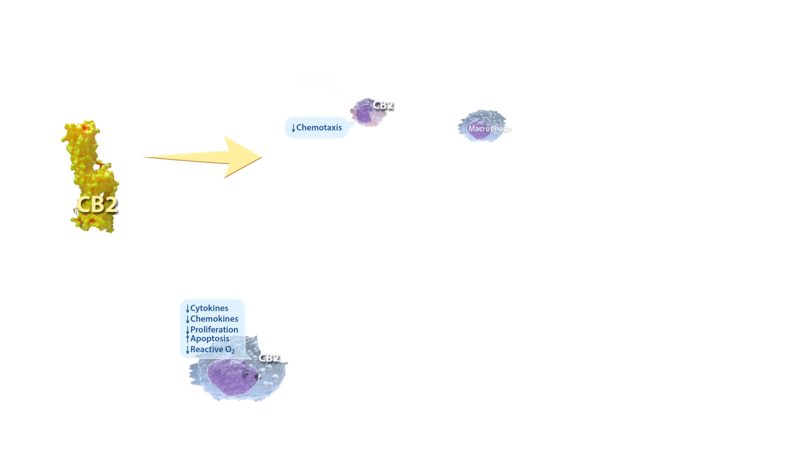 These molecular triggers induce a complex inflammatory response that is characterized by the recruitment, proliferation, and activation of a variety of immune cells including neutrophils, macrophages, NK cells, B cells, T cells, fibroblasts and endothelial cells that together make up the cellular response that orchestrates tissue repair. It’s important that inflammation is limited to the location of damage and doesn’t persist longer than needed, which can cause harm. Arterioles are associated with many inflammatory disorders. They actively change their cellular functions during inflammation in ways that are essential for maintenance of homeostasis and self-defense. Vascular system is responsible for circulation of red blood cells coupled with oxygen and white blood cells engaged in immune response. Inflammation is one of the primary responses of the immune system to harmful stimuli, such as infection or tissue injury. The symptoms of inflammation are caused by increased blood flow into tissue that carry along immune factors predestined to eliminate the initial cause of the distress. These include monocytes, macrophages, neutrophils and B-cells, all of which abundantly express functional CB2 receptors. 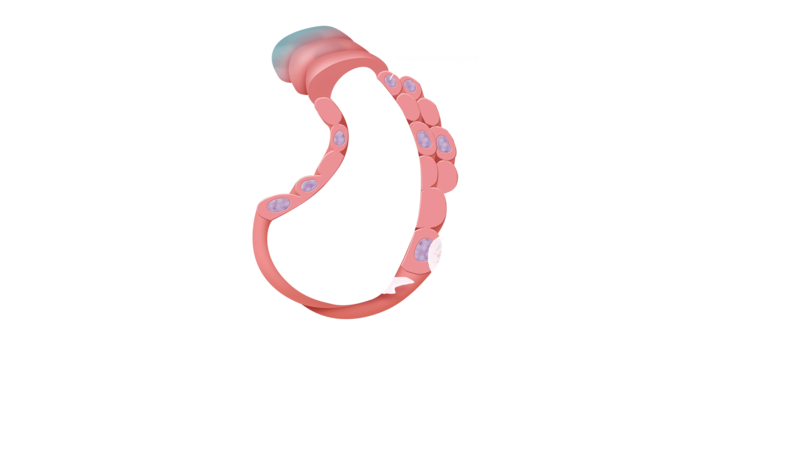 Exterior side of the blood vessels is composed of smooth muscle cells. 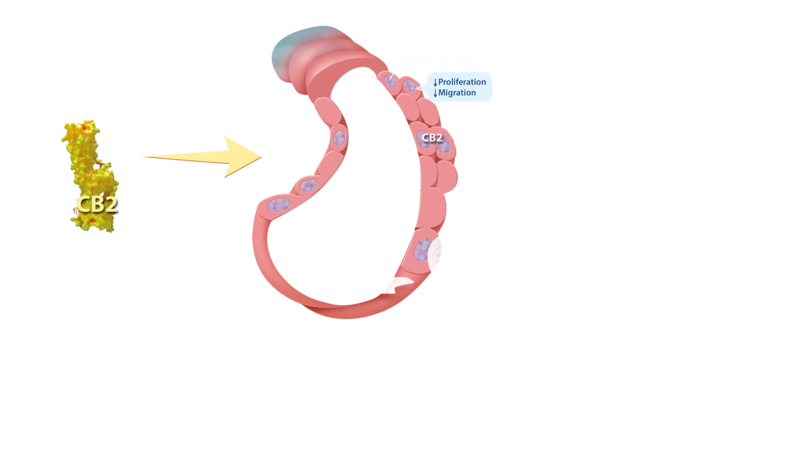 Vascular smooth muscle regulate diameter of the arterial lumen and therefore are responsible for controlling the blood pressure. 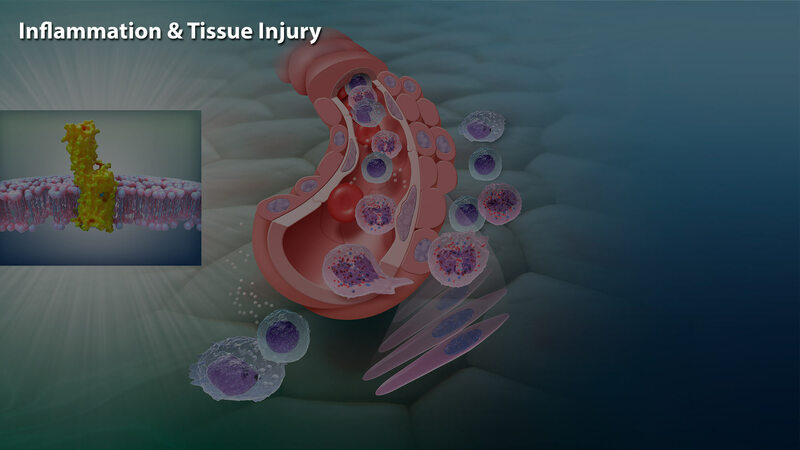 Tissue Injury leads to smooth muscle contraction that increases white blood cell infiltration into the damaged tissue. 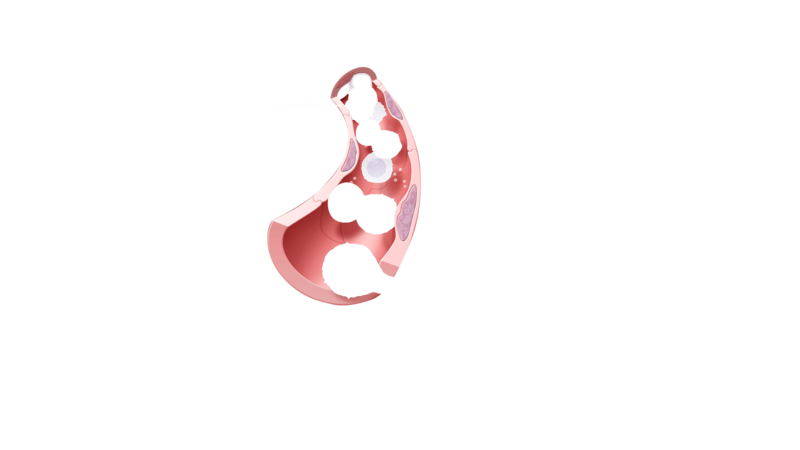 Endothelium lines the interior surface of blood vessels, forming an interface between circulating blood or lymph in the lumen and the rest of the vessel wall. It is involved into trafficking of leukocytes into the bloodstream and therefor controls the inflammatory response. Virtually all of the immune cells are involved in inflammatory response but fibroblasts are early players in initiating inflammation. 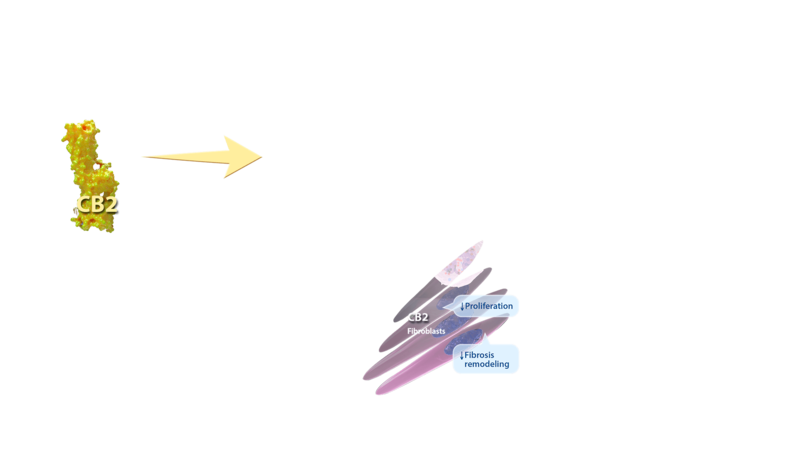 Following tissue injury, fibroblasts induce chemokine synthesis, which in turn activate chemotaxis of immune cells. 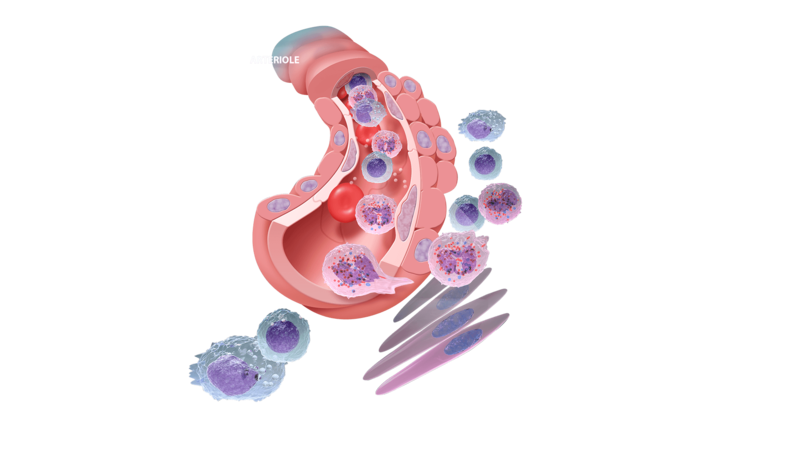 Monocytes and macrophages undergo substantial phenotypic and functional changes to in order to mediate the initiation, maintenance, and resolution phases of tissue repair. Activated macrophages release proinflammatory factors (cytokines such as IL-1 or TNFα) causing vasodilatation and increased permeability of the blood vessels that facilitates Neutrophils migration. 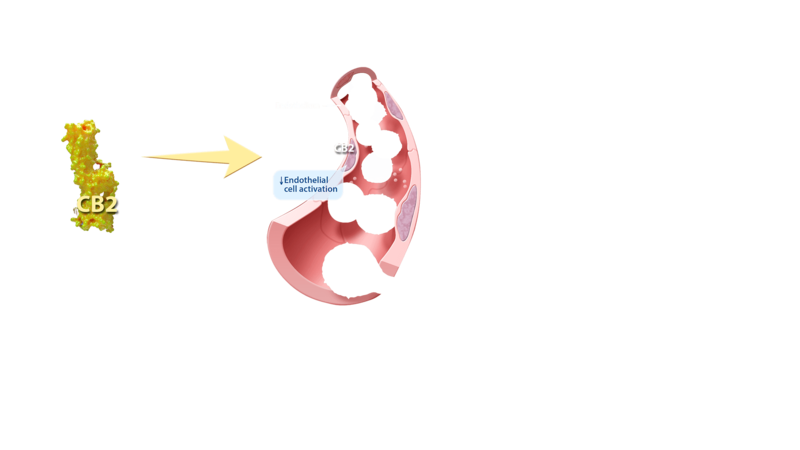 On the site of the injury or infection, neutrophils can resolve the cause of the issue through three different strategies: generation of neutrophil extracellular traps, phagocytosis or release of soluble anti-microbiotic agents. More resistant infections require the activation of adaptive immune system. 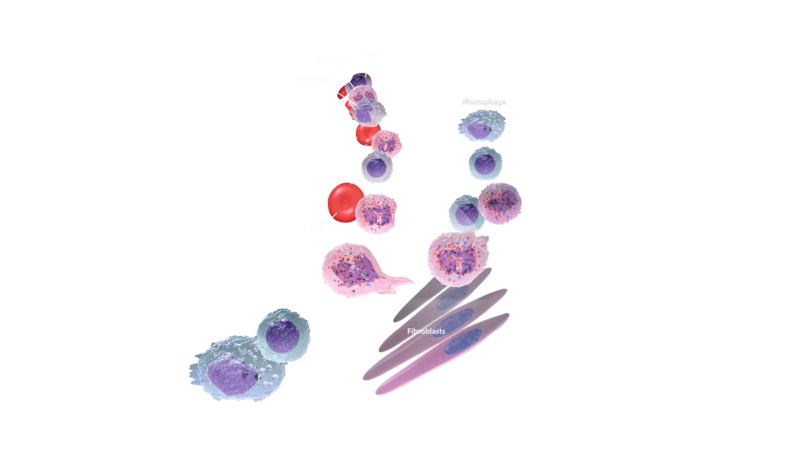 B-cells are professional antigen-presenting cells, meaning that they produce antigens responsible for specific immune response caused by cytotoxic T-cells. Vascular smooth muscle proliferation and migration are critical events in the pathogenesis of atherosclerosis and are directly implicated in the failure of clinical interventions used to treat patients with coronary heart disease. Delta9-tetrahydrocannabinol (THC), a cannabis constituent, has recently been demonstrated to inhibit atherosclerosis progression in a mouse model of the disease, presumably via CB2 receptor stimulation. Interestingly, the expression of CB2 receptors could be enhanced by the pro-inflammatory cytokine TNF-α in vascular smooth muscle cell. CB2 receptor stimulation attenuates TNF-α-induced (but not basal) cell proliferation as well as cell migration of vascular smooth muscle cells. The proinflammatory cytokine TNF-α is considered to play a key role in increasing the expression of endothelial-cell adhesion molecules and promoting the release of various chemokines recruiting monocytes to the site of injury and enhancing their adhesiveness to the endothelium. CB2-receptor activation attenuates TNF-α-induced adhesion of monocytes to aortic endothelium through the inhibition of ICAM-1 and VCAM-1 expression and the CB2 expression can be enhanced by the proinflammatory cytokine TNF-α in endothelial cells. 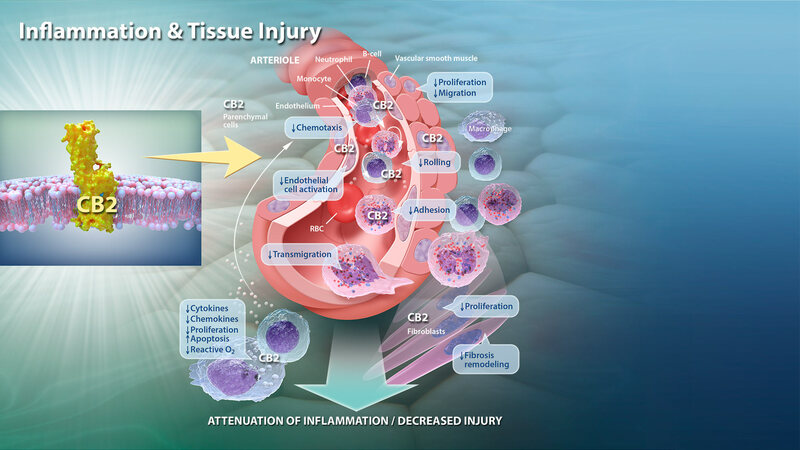 Numerous recent studies have demonstrated that CB2-receptor activation may also protect against myocardial, cerebral, and hepatic ischemia-reperfusion injuries by decreasing the endothelial cell activation, the expression of adhesion molecules ICAM-1 and VCAM-1, TNF-α, and chemokine (MIP-1α and MIP-2) levels, neutrophil infiltration, lipid peroxidation, and apoptosis. Collectively, CB2-receptor stimulation may offer a novel treatment strategy of a various inflammatory diseases, including atherosclerosis. Macrophages exert pivotal regulatory activity at all stages of tissue repair and fibrosis. 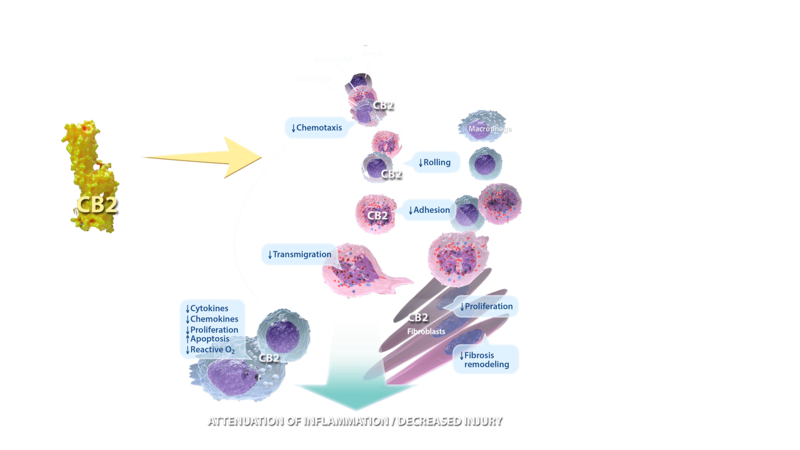 Following tissue injury, local gradient of chemokine and adhesion molecules cause a recruitment of inflammatory monocytes, macrophage precursors from the bone marrow. Growth factors and cytokines released in the local tissue microenvironment stimulate proliferation and differentiation of the recruited and resident macrophage populations. Activated macrophages further release chemokines, matrix metalloproteinases, and other inflammatory factors that initiate the cellular response upon tissue injury. They also stimulate fibroblast differentiation into myofibroblasts that are responsible for wound contraction and closure. CB2 stimulation suppress macrophage activation and proliferation. Moreover CB2 activation stimulates macrophage apoptosis and decrease production of pro-inflammatory cytokines, chemokines and reactive oxygen species. 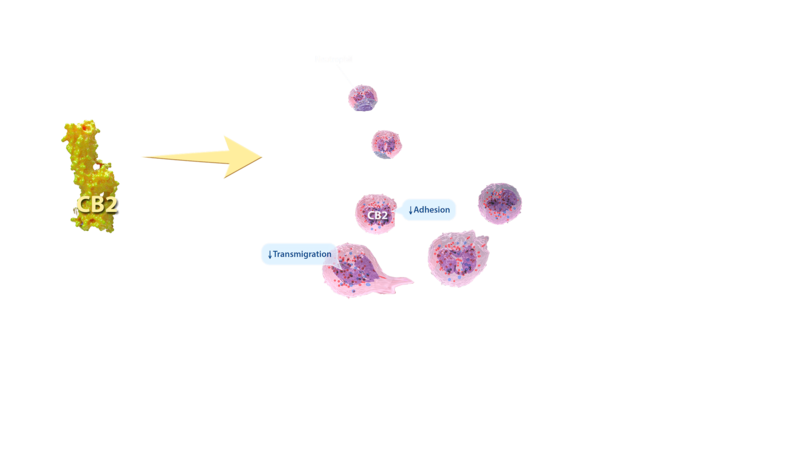 Neutrophils are primarily the first inflammatory cells to one respond and migrate towards the site of inflammation. CB2 activation suppresses both adhesion to the endothelium and transmigration through blood vessels towards the site of the injury. B cells react to bacteria and viruses by producing large quantities of antibodies which are then used to neutralize them. Upon recognition of and activation by pathogens, cytokine release leads to B-cell chemoattraction toward the site of the infection. 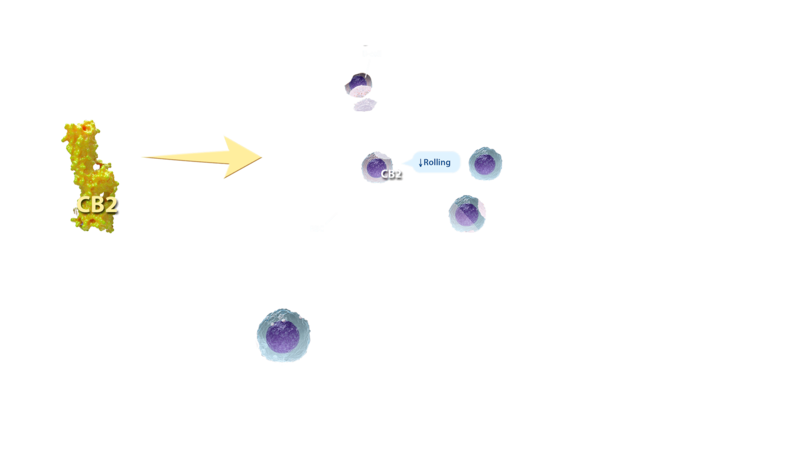 B-cells are drawn from the circulating blood toward the endothelium and than slowly roll on its surface. CB2 activation suppress the leukocyte rolling and therefor inhibit the inflammation. Fibroblasts are the starting point in initiating an inflammation and an end-point in tissue repair. Inflammatory stimulus (i.e. LPS) to fibroblasts induces an increase in the expression of CB2 receptors. CB2 stimulation lowers the concentration of distinct pro-inflammatory factors (i.e. IL-6 and MCP-1) and enhances the concentration of anti-inflammatory factors (i.e. TGF-β). Moreover, CB2 agonists induce a more efficient wound healing process through inhibition of fibroblast proliferation and fibrosis. Overall, endocannabinoid system is a prominent regulator of immune system. Its activation exerts mostly immunosuppressive action through downregulation proinflammatory factors such as cytokines, chemokines or reactive oxygen species. Moreover, CB2 activation suppress proliferation and migration of immune cells and ease the wound healing through the inhibition of fibrogenesis. It is now clear that endocannabinoid system is a key element of human physiology and is a vital molecular system for homeostasis maintenance. Beyond the central nervous system, ECS is highly engaged in the immune system control. Thus, targeting ECS, especially peripheral CB2 receptors, is a very promising therapeutic strategy. Cannabinoid-mediated immunosuppressive action can be of benefit in various human disorders, specifically those with autoimmunological origin such as atherosclerosis or dermatitis. However, further research is still needed as both immune and endocannabinoid system are characterized by complex, redundant and pleiotropic mechanisms of action which makes the translation of basic science results onto clinically valuable tools a very challenging task for all the scientists, physicians and entrepreneurs.